Kannada is a Dravidian language spoken primarily in Karnataka State in South India, and has a literature that dates from the ninth century. It has a population of 35,346,000 speakers, and is spoken not only in Karnataka, but to some extent in the neighboring states of Andhra Pradesh, Tamil Nadu, and Maharashtra. 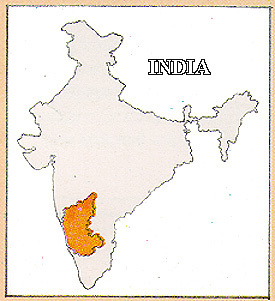 The literacy rate in Kannada is estimated to be about 60%. Kannada is written with its own script, which is similar to the script used also for Telugu. The Kannada script is also used for writing Tulu. These lessons are designed to introduce the beginner to spoken Kannada. They should be used before beginning with other materials designed for intensive courses in the spoken language. Preliminary Lesson 5 Liking, Wanting: "Dative-Stative"
Chapter 1: Introduction and Phonological System. Chapter 2: The Noun Phrase. Chapter 3: The Verb Phrase.